Aged leather jacket - exactly what biker jackets should look & feel like. 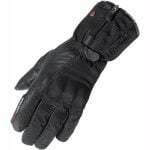 This is the perfect leather summer glove: Held make an excellent fabric-based version (the 'Air Stream II') and these summer gloves are essentially the leather 'brother model'. All you really need to know is that most summer gloves are fine, until you have a spill. If you were ever to have a mishap in vented motorcycle gloves make sure it is this model or the Held Airstream II as the CoolMax lining means you'll be protected from most of the water. Held Air n Dry: Do you know the complete Held 2-in-1 gloves range?